A third instalment of the ranking of Portugal's top players from around the continent. It could be seen as a hypothetical prediction of how Fernando Santos currently ranks his players and who is most likely to get called up to the national team. 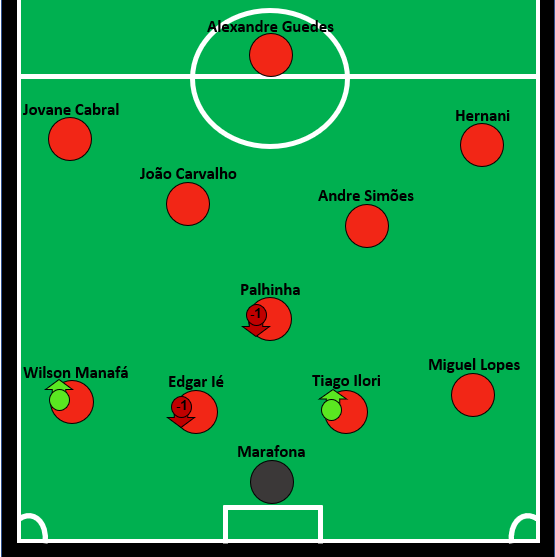 Team A should be seen as a version of what Santos likely considers his starting eleven. The second team is then likely to comprise of the players included in any upcoming Portugal squad but generally serve as backup options for the starting eleven. Those in Team C are on the fringe of making the cut but will likely not get on a call-up - and so on. 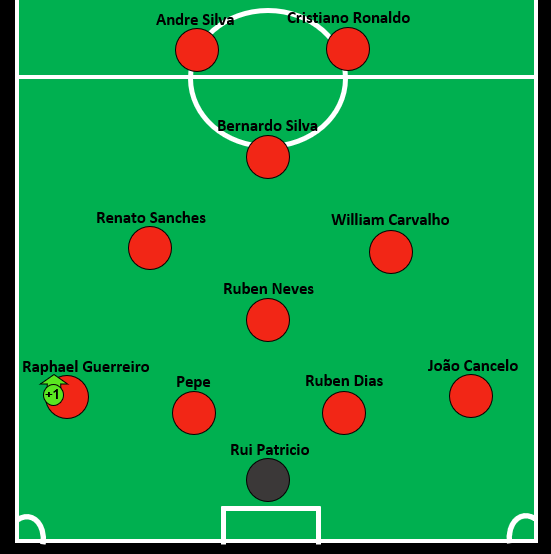 You can find the previous edition of Portugal's eight best squads HERE. In the meantime, let's get into the article. XI in text: Rui Patricio; João Cancelo, Ruben Dias, Pepe, Raphael Guerreiro (+1); Ruben Neves, William Carvalho, Renato Sanches, Bernardo Silva; Cristiano Ronaldo, Andre Silva. Not much change to the 'A' team. Goalkeeper picks himself, as does the majority of defence, midfield and attack. One subtle change is the introduction of Raphael Guerreiro at left back. Performing to a high standard yet again for Dortmund, he moves up one place and likely deserves to start ahead of Mario Rui. That spot in midfield alongside William and Neves really is open though. 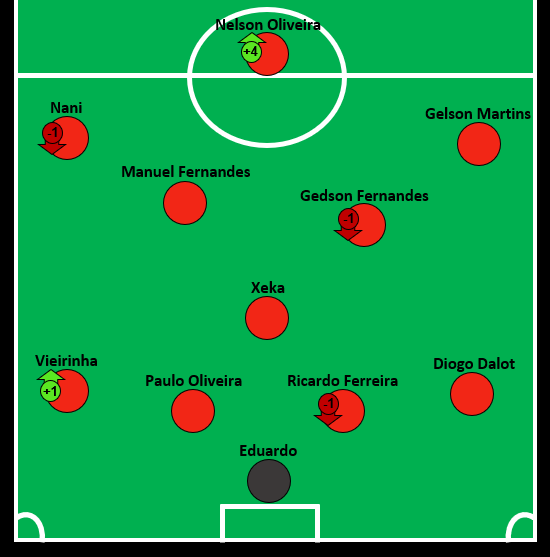 You could easily see at least 6 players who are worthy of slotting into that position; Renato Sanches, João Mario, João Moutinho, Bruno Fernandes, Andre Gomes, Pizzi... Even Bernardo Silva could play that role. To say Portugal are stacked in central midfield would therefore be a bit of an understatement. We've plunked for Renato, purely because he offers a great deal of energy to the centre of midfield, which Santos will likely appreciate. XI in text: Anthony Lopes (+1); Cedric Soares, Jose Fonte, Pedro Mendes (+1), Mario Rui (-1); Danilo Pereira, João Moutinho (+2), Bruno Fernandes (+1); Rafa Silva, Gonçalo Guedes, Rafael Leão (+4). Anthony Lopes hasn't even been in Portugal's squad in recent times, but the Lyon goalkeeper is a Champions League calibre shot-stopper and should probably serve as direct understudy to Rui Patricio, ahead of Beto. While Mario Rui moves down a place, João Moutinho's terrific performances for Wolves see him move up by two, the Portuguese legend currently fully meriting reintegration into the upcoming Portugal squads. His passing and composure on the ball has been to a level we've only come to expect from the maestro. But the biggest mover in the squad without a doubt was Rafael Leão. The Lille striker has been in immense form recently with 4 goals in 5 games and, despite only being 19, he should be fast-tracked into Portugal's senior team, with no obvious top-class out-and-out striker options after Andre Silva available to Fernando Santos. 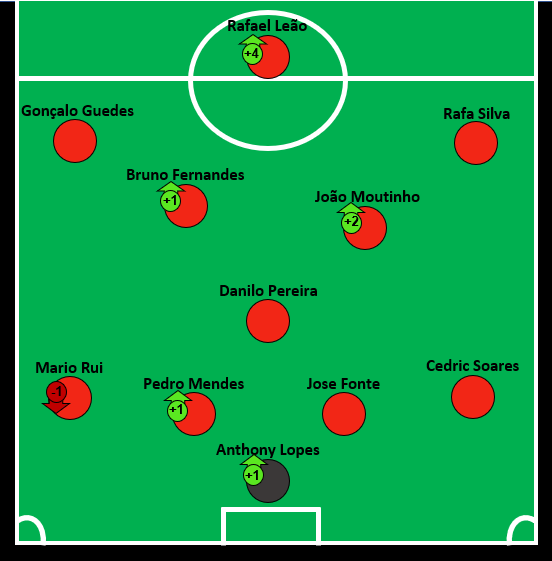 Again so difficult to call central midfield again, Portugal with so many options in that area, but Bruno Fernandes deservedly moves up alongside Moutinho into the B team. 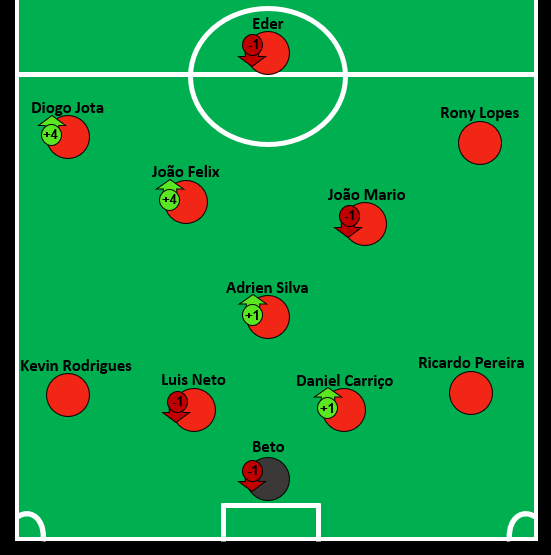 XI in text: Beto (-1); Ricardo Pereira, Luis Neto (-1), Daniel Carriço (+1), Kevin Rodrigues; Adrien Silva (+1), João Mario (-1), João Felix (+4); Rony Lopes, Diogo Jota (+4), Eder (-1). A few little movers in this one, Beto and Eder dropping down, while Daniel Carriço and Adrien Silva each move up one squad each. There's not much more Carriço could do to get a call-up for Portugal. Vice-captain of Sevilla, playing regularly, contributing to his side sitting in the top 4, and offering a great deal of experience. Injury has held him back significantly and is why he's only ever played for his country on one occasion, but while the 30-year old is fit and available, he should be utilised by Fernando Santos. Adrien Silva has done nothing to deserve to move up in all honesty, but because he's a slightly more defensive option than Portugal's other central midfielders,he should be included as he is very possibly Portugal's next best 'holding' midfielder. His move to Monaco should also do him wonders, and he deserves to move above Sergio Oliveira, who had been left out of his own Porto side extensively too before completing a loan move to PAOK. The big mover, though, is João Felix. Rising four places, the teenage superstar has been terrific for Benfica - and could burst onto the international stage very soon indeed. Diogo Jota has also moved up four places to be well in contention for a Portugal callup in the near future, the Wolves man in terrific form over the last month. 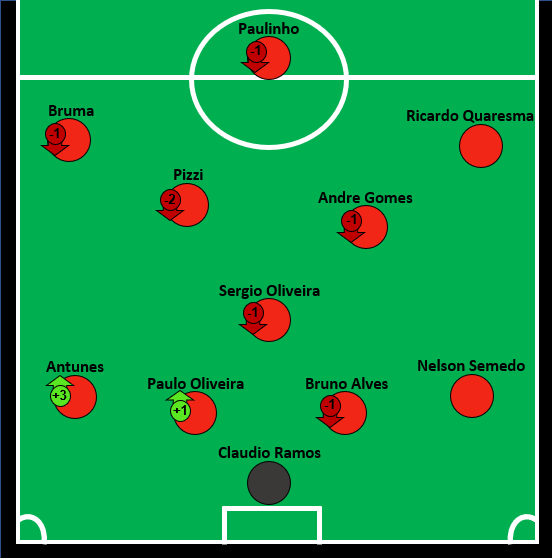 XI in text: Claudio Ramos; Nelson Semedo; Paulo Oliveira (+1), Bruno Alves (-1), Antunes (+3); Sergio Oliveira (-1), Pizzi (-2), Andre Gomes (-1); Ricardo Quaresma, Bruma (-1), Paulinho (-1). Two move up into the hypothetical fourth team as Paulo Oliveira takes the place of the injured Ricardo Ferreira, while Antunes' prolonged game time in La Liga with Getafe has seen him shoot up from the G team to the D team. Several players move down into the D side though. Bruno Alves unlucky to do so, the veteran centreback being a key player for Serie A outfit Parma, and has performed admirably for the newly-promoted side, even linked to Juventus in the past few days! But, now 37 and with a few Portuguese centrebacks currently performing well, Fernando Santos will likely choose alternatives to the European champion. The trio in midfield all move down too and, my word, what a terrific trio that is for a supposed D team to illustrate the incredible depth Portugal have in that department. Sergio Oliveira has just completed a loan deal to Greek leaders PAOK and it will be interesting to see how he does there. But in terms of both Pizzi and Andre Gomes, it really is somewhat unjustifiable to have them only in the D team. Between them and the likes of João Mario, João Felix and Bruno Fernandes, it is difficult to call, and Fernando Santos has a tough task on his hands to decide who gets a call-up. Paulinho also drops down one place as a result of the rise of Rafael Leão, while Claudio Ramos will very probably see his stay in the Portugal squad come to an end. XI in text: Eduardo; Diogo Dalot, Paulo Oliveira, Ricardo Ferreira (-1) Vieirinha (+1) ; Xeka, Gedson Fernandes (-1), Manuel Fernandes; Gelson Martins, Nani (-1), Nelson Oliveira (+4). It's to the great credit of Vieirinha that he is still within shouting distance of a call-up to the Portugal national team. The former Wolfsburg right winger modified his game to become a very solid right back - and a European champion with Portugal - before now being utilised effectively as a left back at PAOK, who he also happens to be the captain of. Few players go from playing right wing to left back in their careers, even fewer do it while leading their team to unlikely title triumphs along the way. Deserves more recognition for his achievements. So devastating for Ricardo Ferreira though. A very solid centreback, hoped by many to be the stop-gap between Pepe and the next generation of centrebacks, but his injury troubles really have got the better of him. After returning from a year-long knee injury, he finally played competitive football again for the Braga B team last month - only to suffer another injury setback 35 minutes later and another spell on the sidelines. Truly tragic. On the flip side, there was great news for Nelson Oliveira, who completed a terrific and much-needed move to Reading this window. The 27-year old striker wasn't included in any of the eight squads in the last edition of this article just 2 months ago having not played a single minute of competitive football for Norwich all campaign, so has truly risen from the very bottom. Now at Reading, there's great hope for him. Jose Sá; Andre Almeida, Rolando (-1), Ruben Vezo, Ruben Vinagre (-1); Alfa Semedo (+1), Tozé, Andre Andre; Ivan Cavaleiro, Daniel Podence (+1), Lucas João (-2). Not much change in the 'F' team. Alfa Semedo, who has previously expressed his desire to play for Portugal, moves up despite hardly playing for Benfica, while Sheffield Wednesday striker Lucas João moves down two places, who hasn’t been playing the last few games for the Championship outfit. Daniel Podence also moves up, having performed very well for Olympiakos this campaign, while Ruben Vinagre, who has still found game time difficult to come by at Wolves drops down a place alongside Rolando. XI in text: Joel Pereira; Ricardo Esgaio, Diogo Leite (-1), Andre Pinto, Fabio Coentrão (-3); Miguel Veloso (+1), Tarantini, Andre Horta (-2); Ricardo Horta (-2), Helder Costa (-1), Wilson Eduardo. Fabio Coentrão sees a drastic drop in ranking; the former Portugal international has played regularly and performed well for Rio Ave this season, but has been used much further forward and regularly on the right side at the Portuguese outfit. That likely makes other left backs better options at this time. Ricardo Horta also moves down, not because of any loss of form, but simply due to the terrific form of Diogo Jota and the continued game time Daniel Podence has had at Olympiakos. His brother, Andre, also moves down with him; since his move to the MLS, his chances of representing Portugal have reduced dramatically. Miguel Veloso is the only player to move up, having played fairly regularly since resigning for Genoa. XI in text: Marafona; Miguel Lopes, Edgar Ié (-1), Tiago Ilori (+), Wilson Manafá (+); Palhinha (-2), Andre Simões, João Carvalho; Hernani, Jovane Cabral, Alexandre Guedes. We now come to the bottom team, and not much to report on this one with it largely staying the same. Tiago Ilori is moved up into the side though after a high-profile move to Sporting CP while Manafa completed a big move of his own, joining Portuguese champions FC Porto from Portimonense. The versatile player can play on either wing or at full back on either side, so it will be interesting to see where Porto use him most. Palhinha, meanwhile, hasn’t played as regularly as many would have anticipated at Braga, and he drops two places accordingly. Lille’s Edgar Ie also falls down the pecking order.